Homemade ice cream is our hallmark. Try our ice cream prepared without using animal ingredients. If you don't feel like taking an ice cream try our magnificent cafeteria. ‘Il Gelataio’, an artisanal commerce was founded in 1998 by Michele di Giacomo and his partners. Since 2015 Michele is the only manager, adding to the management his experience acquired by several years. This commerce, tries to keep all of his artisanal qualities and true flavors. 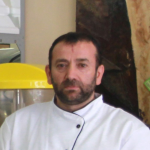 His filosophy goes beyond the business, its about passion, where his meticolous job consists in offer to adult and child the possibility of tasting the freshness of their carefully prepared daily products.